If the first row (row 1) or column (column A) is not displayed in the worksheet, it is a little tricky to unhide it because there is no easy way to select that row or column. You can select the entire worksheet, and then unhide rows or columns (Home tab, Cells group, Format button, Hide & Unhide command), but that displays all hidden rows and columns in your worksheet, which you may not want to do. Instead, you can use the Name box or the Go To command to select the first row and column. In the Name Box next to the formula bar, type A1, and then press ENTER. On the Home tab, in the Editing group, click Find & Select, and then click Go To. In the Reference box, type A1, and then click OK. Under Visibility, click Hide & Unhide, and then click Unhide Rows or Unhide Columns. Under Cell Size, click Row Height or Column Width, and then in the Row Height or Column Width box, type the value that you want to use for the row height or column width. Tip: The default height for rows is 15, and the default width for columns is 8.43. If you don’t see the first column (column A) or row (row 1) in your worksheet, it might be hidden. Here’s how to unhide it. In this picture column A and row 1 are hidden. 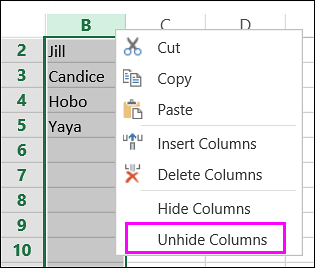 To unhide column A, right-click the column B header or label and pick Unhide Columns. To unhide row 1, right-click the row 2 header or label and pick Unhide Rows. Tip: If you don’t see Unhide Columns or Unhide Rows, make sure you’re right-clicking inside the column or row label.